Pozor! Rozbalená hra, hra byla rozbalena pro kontrolu dílků, nehraná, karty zabaleny, vše ve 100% stavu. Došlo pouze na stržení obalu hry. 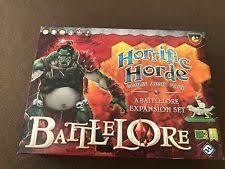 BattleLore: Horrific Horde provides forty-two additional figures for your BattleLore army, including two never-before-seen troop types, as well as even more of the primary Goblinoid staples that are available in both the core set and the Goblin Marauders expansion. With all these added units, Goblins will no longer be relegated to serving as mercenary forces for a standard human army. The time has come to let loose the fury of the Horde!